" Welcome to Kimple Non-Fire colors "
will help you express your creativity like no other color line can! Go Back to Color Index Page..
A general term meaning to apply a color product to the ceramic piece and then using a quality paper towel or soft cloth, wipe back the product from the piece to desired intensity. Antiquing is done with opaques, metallics and translucents in the techniques that follow. When antiquing with opaques and metallics, be sure to work in small sections and wipe the color back quickly to prevent the color from drying before wiping back. Water can be used to help wipe back water-based and water-soluble color products. Antique Media and Antique Solvent can be used to help wipe back oil-based products. Use a brush of appropriate size and shape (this will vary with color product and area of application) to move color product from pallet to the given ceramic area. Use a quality large soft brush to apply 2 thorough smooth coats of given color product to bisque. It is essential that the piece is covered both completely and smoothly. Be sure to work out any brush strokes before the color product has dried. An airbrush can also be used when applying a basecoat. Very lightly drybrush indicated color product to create a very slight coloring effect. This term is most often used in reference to applying color to cheeks, above eyes, paw pads or tummies. Detail- Carefully apply designated colors to the fine details given. Refer to the catalog photo for exact positioning. With the use of a dotting tool or a round toothpick apply color in a uniform �swiss dot� pattern. Dip a stiff round brush of appropriate size into the selected color. With a vigorous �figure 8� motion, wipe a great deal of the color product back out of the tip of the brush onto a paper towel. 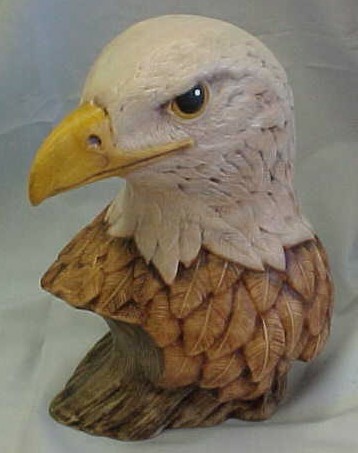 Stroke the brush rapidly back and forth across the texture of the ceramic piece. Your goal in drybrushing is to color the high ridges and details more intensely then the lower grooves. It is important to monitor the amount of color product on your brush at all times. Too much color can fill the grooves and not enough color can lead to a rough surface texture (chalky) from over stroking. Use a small detail brush to apply a small stroke of indicated color to area. Many times more then one small stroke of color will need to be �flicked� into an area to achieve desired effect. Using a water moistened filbert or square shader brush, load one side of the brush with thinned color product. Stroke the brush briefly onto the pallet to slightly distribute color across the brush. Contact the ceramic piece with the color-loaded edge of the brush closest to the ceramic feature to be enhanced and make an even brush stroke following the contours. This technique may require some practice on a pallet or tile. The goal in floating is to use a shaded brush stroke, fading from an intense edge to a less intensely colored edge across the brush to enhance shadows and contours on the ceramic piece. 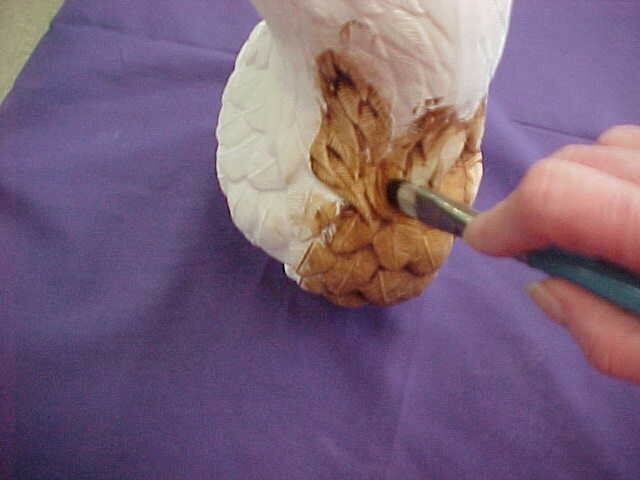 This term is often used to indicate drybrushing or rouging with a VERY light hand. When you highlight with a color product, your goal is to gingerly drybrush or rouge this color in a designated area for a subtle coloring effect. The HL abbreviation is also used in techniques to designate eye highlights. To create an eye highlight, apply a dot of given color using a dotting tool or a toothpick to the upper section of iris. When highlighting eyes, be careful to place the dot of color in the same position and angle on both the left and right eye. Line- Using a detail brush, paint lines of color onto indicated areas. Referring to the catalog picture is often helpful. Paint- Use a brush of appropriate size to carefully and completely apply the indicated color products to designated ceramic areas. After applying the indicated Intense Translucent, Use a cloth or quality paper towel and wipe or pat back the applied color to desired intensity. Apply the given color onto the indicated area to conceal any incidental color overflows or strokes common in wetbrushing and drybrushing. 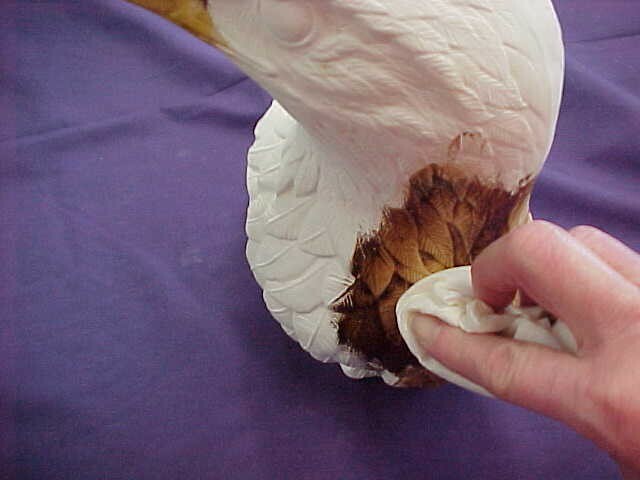 Like drybrushing, this technique requires the wiping out of color product from a stiff round brush. However, in wetbrushing, you will leave a considerable amount of color in your brush. The goal in wetbrushing is to create a smooth intense color with less gradation from light to dark then in drybrushing. This technique is selected many times when the artist wants to bring a dark smooth surface up to a bright intensity with out the �chalky-ness� often accompanying drybrushing. Similar to Pat Back, but if a less intense color is desired, use water or Antique Media to wipe back color. 1. Basecoat bisque carefully cleaned and fired bisque with #750 Bisque Primer. Using a Kimple �I.T.� sable filbert brush and cover bisque smoothly and thoroughly with 2 coats. 2. After basecoat is dry, apply desired Intense Translucent to bisque using a Kimple �I.T.� sable filbert brush to appropriate area. 3. Using a cloth or quality paper towel, wipe or pat back the applied color to desired intensity. If a less intense color is desired, use water or Antique Media to pat back color. Using water to wipe back will pull more color off of the piece then the use of Antique Media will. Antique Media will blend the color more subtilely. 4. If desired, using either of the following methods, apply another color of Intense Translucents to this initial color: --Rouging- To use a towel to apply additional colors to the initial color, tip a section of towel with a small amount of the selected Intense Translucent from your pallet. Rub the color onto a clean area of your pallet to distribute the color evenly into the towel tip. Then rub the color onto the desired area of the ceramic piece. -Applying color with a towel creates a highlighted or �rouged� effect. --Brush Application- To use a brush to apply additional color to the initial color, simply use a Kimple �I.T.� sable filbert brush to apply the desired color to the selected area and pat the color back with a towel. -Applying color with a brush removes more of the initial translucent then rouging, resulting in a more vivid secondary color. 5. After every area of the piece has been completed carefully spray the piece with Perfect Matte fixative in a well ventilated area. Do not over apply the fixative. Intense Translucents will remain slightly tacky until dry and fixed with a sealer. #702 Walnut applied as the initial translucent followed by variously selected and applied Intense Translucent colors is a very effective technique to achieve deep rich colors often desired in old world santas, wildlife and Native American pieces. Any of the Intense Translucent colors can by diluted with water to create lovely washed finishes. They can also be used to create fascinating and creative �brush stroke� pieces. An intriguing opalescent effect can be obtained by mixing any of the Intense Translucent colors with #971 Water Based Gold or #972 Water Based Silver. The mixing ratio will vary depending upon the color intensity desired. This mixture can then be applied to the ceramic piece as an opaque colorant or wiped back before drying to create the effect of an opalescent antique. When combining water based metallics with Intense Translcuents you must be aware that the water based metallic mixture will dry before the piece is fixed with a spray.